I've been a railway fan since taking that first exciting journey on Alaska's Sawtooth Range, from Whitehorse, Yukon to Skagway at five years of age. On South Africa's Rovos Rail, and the Marrakeche express, I felt a similar thrill. Rail technology leader Bombardier Transportation has won the first contract awarded by ADIF as part of the upgrade of the Mediterranean Corridor between Alicante and Barcelona to deliver its BOMBARDIER INTERFLO 200 mainline solution. The section between San Vicente and Tarragona will be equipped by Bombardier, part of a longer section of the Mediterranean Corridor being equipped by a consortium comprising Bombardier and other signalling equipment suppliers. 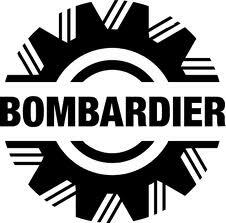 The total contract is valued at approximately 61 million euro ($80 million US), with Bombardier�s share valued at approximately 17 million euro ($22 million US). The Mediterranean Corridor will be upgraded over three years as part of ADIF�s infrastructure improvement plans, which will result in better connections between the Spanish harbours and European freight routes. This will feature the adoption of a dual gauge solution with three rails that will allow either Spanish or international gauge traffic. Bombardier�s scope on the San Vicente to Tarragona section will involve the installation of two new and the upgrade of five existing BOMBARDIER EBI Lock 950 computer-based interlocking (CBI) systems. This first contract is planned for completion by March 2015. INTERFLO 200 signalling solutions are typically used for busy, mainline networks, where headways are reduced and higher safety levels are required. INTERFLO 200 can be complemented with a national automatic train protection (ATP) system and can later be upgraded to European Rail Traffic Management system (ERTMS) operation. INTERFLO 200 has been installed extensively across the world including in Brazil, Russia and Thailand and across Europe, and was recently chosen for one of the largest conventional mainline re-signalling projects in Durban, South Africa. Bombardier Transportation�s Rail Control Solutions portfolio covers the whole range of BOMBARDIER CITYFLO mass transit solutions, from manual to fully automatic, as well as communications-based systems. It also provides INTERFLO mainline solutions, from conventional to ERTMS Level 2 systems. Bombardier also provides a complete palette of wayside and onboard signalling products. Rail technology leader Bombardier Transportation today hosted the world premiere of the Frecciarossa 1000 very high speed train at its Vado Ligure site in Italy. Built by Bombardier Transportation and its consortium partner AnsaldoBreda of Italy, the Frecciarossa 1000 is the newest member of the BOMBARDIER ZEFIRO family of high-speed trains and is known as the V300ZEFIRO model. This first train unit will now begin homologation test runs on the rail line between Genoa and Savona, which is also connected to the Bombardier Vado Ligure site. Regular passenger service is expected for early 2015. Following the presentation ceremony attended by over 250 guests from Italy and other countries, the first group of passengers including Mauro Moretti, Managing Director, Trenitalia, Claudio Burlando, President of the Liguria Region, Lutz Bertling, President and Chief Operating Officer, Bombardier Transportation and Aldo Cingolani, CEO, Bertone Design, boarded the new train. Lutz Bertling was joined by Bombardier employees, Luigi Corradi, General Site Manager, Vado Ligure, Italy and Anders Lindberg, President, Rolling Stock Europe and Asia, Bombardier Transportation. The V300ZEFIRO is the fastest train in Europe and is capable of reaching commercial speeds of up to 360 km/h. During test runs the train will reach speeds in excess of 400 km/h. 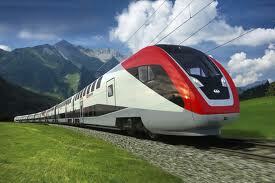 Its advanced high acceleration enables the train to deliver excellent travel times, even on winding routes. It is fully interoperable and will provide cross-border services, taking passengers to other European countries without the need to change trains. It could also be adapted for use on networks in many other countries. The train is an eight-car Electrical Multiple Unit (EMU) that can run in single operation and multiple operation of two units. It will have a total capacity of 485 across four classes, two additional tip-up seats for passengers with reduced mobility and a bistro. My endless fascination with railways and railroad memorabilia goes back to childhood days, when the White Pass & Yukon Railway of Gold Rush fame was linked via Skagway, Alaska, to a vast, complex transportation system of BC-Alaska Coastal steamships, caterpillar trains and Yukon river steamboats. Each trip we made 'outside' from Dawson City on the Klondike to Vancouver, British Columbia, involved four days upstream on the Yukon River by paddle wheeler; a day trip by rail from Whitehorse to Skagway; then another four lazy days steaming southward on CPR's Princess Norah or Louise. We sailed the Inside Passage, along the Alaska Panhandle and British Columbia Coast,stopping at the ports of Juneau, Ketchikan, Prince Rupert and Alert Bay. It's basically the same scenic route used by today's super liners and love boats. As a long time railway fan and originator of "Railways of the World," it's heartwarming to see the WP&YR not only still operating at Skagway, but considering extending the line in future. Len Brown, one of our readers attended a "Last Spike" ceremony on July 29, 2000. Here is an excerpt: " Al York and I do contract work for the Yukon Government, and I was up there working and took in the celebration. It was fantastic - up to an estimated 5000 people were there during the day - steam rides some 5 miles alongside Lake Bennett and back .. and a Steam Meet of 73 and 40. I am a steam nut (co-owner of 30053 - an M7 tank engine that runs on the Swanage Railway in Dor. - I even appeared in a video White Pass & Yukon Route - the Railway Built of Gold. As a Yukoner by birth, I hope someday there will be an extension of this historic rail line at least as far as Carcross, Yukon. Originally called Caribou crossing because of its popularity as a native hunting ground, Carcross was a stopping place for gold stampeders on their way to the Klondike gold fields. Trains haven't traveled to Carcross since 1982. To be continued in our Rail Adventure Annual Edition. 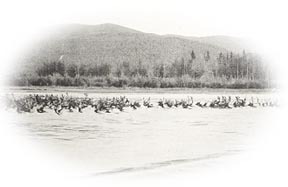 Photo: Caribou Crossing river in Yukon.